“What has been your favourite moment of the World Youth Day pilgrimage?” I was asked this question by a journalist over dinner on one of the evenings towards the end of the World Youth Day week in Panama. There were loads of options. The opening Mass at the beautiful seaside location at Cinta Costera was wonderful. In his homily, Panama’s Archbishop, José Domingo Ulloa Mendieta OSA, really set the scene for the week. 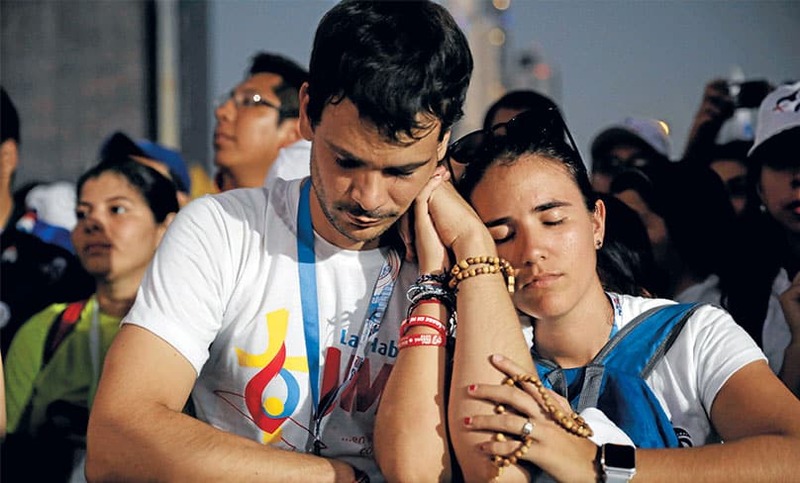 He noted that it was the first World Youth Day with a Marian theme, “Behold the handmaid of the Lord, let it be done to me according to your word,” and thanked Pope Francis for trusting the country to host a WYD, giving the opportunity to attend to “the youth of the existential and geographical peripheries.” For the week, he said, Panama would be “the youth capital of the world.” And so it was. Another stand out was the joyful and genuine welcome we received from the local people. Pilgrims were cheered and honked as they walked through the streets. Signs everywhere, including in major shopping centres, held messages of welcome. One news presenter proposed confiscating pilgrim passports so that they would never leave. Coming from Australia, where oftentimes we can feel that the world is hostile to the visible presence of Catholics, the reception from the community was a real grace. One local parish passed bottles of iced water and biscuits to the thousands walking past, with the parish priest out on the street to greet people. Again, the hospitality of the Panamanian people was just outstanding. But the real stand out for me, I told the journo, was not planned. Indeed, it came out of what might be described as two logistical screw ups that demonstrated a break down in the WYD planning process. At the opening Mass, the distribution of Holy Communion was not well organised at all. Maybe three minutes had passed between the Archbishop of Panama himself consuming the Eucharist, and him giving the final blessing to those gathered; there was no time allowed for the distribution of Holy Communion to the tens of thousands gathered, nor were the umbrellas (that usually indicate where pilgrims could receive the Eucharist) used. No one knew where to go, so most just left. But the Sydney Catholic Youth pilgrimage chaplain, Father Lewi Barakat, went looking for who might be distributing Holy Communion, and then – when he located them – brought the pilgrims in groups back to the spot so they could receive the Lord. The job of a chaplain is to bring the pilgrims to Christ and Christ to the pilgrims, and that’s exactly what he did. It was a simple thing, to be sure, and he didn’t need to say a word, but his actions reinforced to the group that the Eucharist must be at the centre. The following morning, catechesis and Mass was conducted in what I had dubbed the “Carpark Cathedral,” a gravel car park with no shade next door to a local parish. The parish was hosting catechesis and Mass in another language inside, so the English speakers were outside. It was hot and uncomfortable, especially so for the clergy who were fully vested for the Mass. At Holy Communion time, they ran out of hosts (by a significant number). Archbishop Anthony Fisher, also accompanying the Sydney group, was distributing Communion in the sun. He began carefully and reverently breaking each host into small pieces, in order to ensure the pilgrims received the Eucharist. He went back three times for more hosts and then finally, when this still wasn’t enough, managed to obtain some more from the next door parish, going into the crowd to locate those who were still to receive Holy Communion and ensuring they did. Again, the chaplain to the pilgrimage had as his main focus that he must bring Christ to the pilgrims. Like Father Barakat, the Archbishop didn’t need to say anything to the pilgrims: his actions spoke loudly that the Eucharist really is the ‘source and summit’ of our faith. When I mentioned it to him a little later, he seemed surprised that I had found it so noteworthy. “It’s what I’m for,” he told me. “It would never have occurred to me to do otherwise.” And while I know that to be true, it was just really beautiful to see it in action. It is something that will stay with me long after we return. I think I concluded last week’s column by saying that we can be really proud of our pilgrims. We can. We can also be very proud of, and grateful for, the clergy who accompanied them. Their example made a huge impact on all of us.